A NEW credit card-style driving licence containing a chip that holds information about the driver is to be introduced within the next 12 to 18 months. Minister Noel Dempsey is hoping to introduce the plastic credit card-type licence with a microchip which would address a number of security and enforcement issues, particularly fake licences and the fact that a garda stopping a motorist does not know from an examination of the driver's licence whether they are disqualified. The cards will hold a photo; the driver's name, address, date of birth, class of licence, and details of the issuing authority. It will also carry a record of any penalty points on the driver's record. The new licences will have additional security features not available on the paper licence to make counterfeiting more difficult. The changes are part of a European project to introduce a credit card-style driving licence by the start of 2013 to assist cross-border policing of motoring offences. These will be mutually recognised by member states. The number of penalty points handed out for speeding is going to rise by the middle of 2010 when a network of 45 speed cameras operated by a private company is introduced. The Road Safety Authority (RSA) and An Garda Síochána Launch of the 2009/2010 Christmas & New Year, Road Safety Campaign. President Mary McAleese officially launched the Xmas Road Safety campaign for the RSA and An Garda Síochána in Dun Laoghaire today in the National Rehabilitation Hospital where many survivors of road traffic collisions often end up after a horrific road crash. PARC members attended. During her speech Mrs McAleese highlighted the fact that next to the cold graveyards that hold the bodies of all those killed on Irish roads, the rehab knows about the broken bones and broken lives that result from the ordinary, everyday journeys that people make. Over 530 people were killed in road traffic collisions during the six-week Christmas and New Year period between 1997 and 2007 and 1,557 suffered serious injuries. The majority of the patients in the rehab with road traffic crash related injuries are young males with traumatic brain injuries, traumatic spinal cord injuries and traumatic limb amputations. She said that there is no excuse for drivers who use the roads when they are under the influence of drink or drugs adding that it is a personal choice and is selfish, dangerous, inexcusable and downright bad. Look out for one another with a renewed determination and commitment this Christmas. Arrange the car pools, pre-book the taxis, nominate designated drivers, offer the elderly isolated neighbour a lift, don't pressure any driver to take a drink, don't drive when you are exhausted, wear the seat-belts and the high visibility clothes, slow down, listen to the weather forecasts, notice the dangers, read the signs, stay focused. A total of 213 people have died in road crashes so far this year. Recently Dr. Bedford, a public health specialist with the Health Service Executive examined files on 599 crashes in which a driver survived. He discovered that only 8 per cent of surviving drivers involved in a fatal crash in 2004 and 2005 were tested for alcohol. In 92 per cent of cases, or 551 crashes, he could find no evidence the driver was tested for alcohol. The crashes examined in the study include those where a passenger, pedestrian, cyclist or other motorist was killed. It was based on material gathered for the report Alcohol in Fatal Road Crashes in Ireland 2003 to 2005 published by Dr. Bedford based on coroners' reports on fatal crashes. The Third Sunday of November has been recognised in many European countries for several years as the Day Of Remembrance For Road Traffic Victims. Every day, 3,000 people die and around 100,000 are injured on the world's roads. Services will take place in Knock Shrine for people who were injured or lost their lives in road traffic collisions. Mr. Sean Costello will be singing at the Knock service. The service in Knock Shrine will take place at 12 noon 15th November 2009. Members from all the emergency services including the fire service and ambulance service are being invited. Come and remember your loved ones who have lost their lives or have been injured in road collisions. Today in Dublin Castle the Road Safety Authority (RSA) and The European Transport Safety Council (ETSC) are holding their 11th European Transport Safety Council Lecture. This year's conference will deal with the most important facts and questions related to the topic of alcohol and driving from a general, technical and psychological perspective. Driving whilst under the influence of alcohol contributes annually to 10,000 deaths on EU roads. In some EU countries, alcohol has become the greatest risk factor of road crashes. PARC members write to all Oireachtas Members requesting their support for the new Road Traffic Bill which is due to be published shortly. This life saving legislation will include provisions to reduce the blood alcohol level for drivers in Ireland and the introduction of mandatory testing of all drivers involved in collisions attended by Gardai. We have asked all members to reply to indicate their intention to vote in support of these measures. During this meeting Mr. Noel Brett stated the following: "Concerning mandatory testing at the scene of collisions, I am advised this is included in the road traffic Bill which is shortly to be published. When a person is involved in a collision and there is mandatory testing of all drivers in all collisions and not only those that involve injuries or fatal collisions, that will be a huge deterrent. It will make people think twice about taking to the road having consumed alcohol or drugs. When the collision happens and somebody is dead or injured, at that point all that mandatory testing does is clear somebody's good name or apportion guilt. That is important for the people concerned but the part I am interested, at policy level and on a national level, is the deterrent effect. That is hugely important. I am advised that this is included in the Bill and it is not before time. The sooner the better. Regarding blood alcohol level, a question was asked about levels between the current 80 mg level and 50 mg. Dr. Declan Bedford has looked at 995 case files. He got access to the files in the Garda traffic corps. These are the actual investigation files for the years 2003 to 2005 about which we have just been talking. The 995 case files involved 1,105 fatalities. Dr. Bedford looked specifically at people who were below the current limit of 80 mg but were above 20 mg. He did that because all the international research shows that above 50 mg there is real impairment. We are going for 50 mg because there is evidence for it. Dr. Bedford looked at those cases and found 18 drivers who died in crashes during that period who had a blood alcohol level of between 50 mg and 80 mg. He found a further 18 drivers who had a blood alcohol level between 50 mg and 20 mg. That makes 36 drivers who were below the current drink drive limit in that two-year period alone. Dr. Bedford looked further at 309 specific crashes and found that 31% had a blood alcohol level above 20 mg. He discounted anybody below 20 mg. He further found that in collisions in Ireland, 34% of drivers had undergone no test, thus making the case for random roadside checking. His conclusion is that there is a massive underestimation. If 34% of all those fatalities were not breath tested or had no blood taken in hospital, then there is underestimation. He is clear about his finding of underestimation in Ireland and that in a third of the cases no blood alcohol reading was available. He actually goes further than the Road Safety Authority. His findings are that the limit should become 50 mg immediately and, as quickly after, it should go to 20 mg.
Countries that have the legal limit of 50 mg, are Australia, Austria, Belgium, Bulgaria, Canada, Denmark, Finland, France, Germany, Greece, Israel, Italy, the Netherlands, Portugal and so on. These are all at 50 mg and Ireland and the United Kingdom are the countries left at 80 mg. Many other countries have gone further, down to 20 mg. Ireland and the UK are the only countries left with a blood alcohol limit at 80 mg. Many other countries have gone further and reduced the limit down to 20mg. How can it be right? Those countries did not go there on a whim, but because of the scientific evidence and in the knowledge that there is significant impairment, even at a limit of 50 mg. How can we say to our citizens that it is safe to drive when all of these other countries instruct their citizens that they cannot drive at a half or a quarter of our limit? In terms of impairment, proper scientific laboratory tests have found that drivers are significantly impaired at a blood alcohol level of 50 mg. The impairment affects visual ability, vigilance, drowsiness, psychomotor skills and the way they process information compared to performance at a level of zero. The best research I can provide is that one is at a risk of crashing four to ten times greater at a level of 0.5 than at 0.7. When the Netherlands reduced its limit to 0.5 or 50 mg in 1974, there was a sustained reduction in alcohol related collisions. France lowered its limit from 80 mg to 50 mg in 1996 and it has seen a sustained drop in alcohol related collisions. Austria reduced the limit in 1998 and it realised a 9.4% decrease in alcohol related crashes. Australia carried out a longer study lasting between 13 and 17 years. It found that the states that reduced the limit from 80 to 50 had what it described as a meaningful decline in alcohol related crashes. There was a 14% reduction in Queensland and an 18% reduction in some other states. New South Wales reduced serious collisions by 7% and fatal collisions by 8%. Sweden is one of the countries that leads the way in road safety terms. In the six years following the introduction of a 0.2 limit - stricter than our proposal - it reported a further 9.7% reduction. Countries in Europe are already moving from a limit of 50 mg to 20 mg because of the evidence and the reduction in alcohol related incidents. Moskowitz is probably the most extensive researcher in this area. He examined 112 peer reviewed scientific and medical research papers. He concluded that by the time subjects reach a blood alcohol level of 0.5 or 50 mg in the majority of experimental studies examined significant impairment was reported. That is the evidence throughout the country. PARC felt it necessary to hold a press conference today in Buswells Hotel to highlight the following and make a statement on same. Mr. John O' Donoghue TD and Ceann Comhairle replied to PARC Road Safety Group after we had written to all members of the Oireachtas in order to ascertain their views on the lowering of the blood alcohol level and the need for mandatory testing at all collision sites, and he told us that, "In view of the Ceann Comhairle's constitutional position and as the final arbiter on matters which may arise in the House during debate on legislation, the Ceann Comhairle cannot become involved in matters which are political in nature". Having accepted his explanation PARC were shocked and saddened when informed that Mr O'Donoghue had no difficulty lobbying on behalf of the Vintners Federation, meeting with them on occasion and being very supportive of their argument against the lowering of the BAC and made representations to the Transport Minister on their behalf. Mr. O'Donoghue as Ceann Comhairle, has the casting vote in Dail Eireann and is required to be impartial in matters before the Dail. In the circumstances PARC has no alternative but to call on him to resign as he had not kept the standards which he had outlined in his letter to PARC. Endless delays in lowering Ireland's drink-driving limit. The Government has missed its own deadline to cut the limit-- it was supposed to be in place by this summer. Ireland currently has the highest drink-driving limit in the EU and in November 2007 the Road Safety Strategy promised that the country would have a lower alcohol limit by April 2009. Minister Dempsey said legislation to lower the drink-driving limit will be published before Christmas. However it may not become law before the end of the year. He insisted government attempts to simplify the new Road Traffic Bill had led to a delay in reducing the limit for motorists. That is despite a promise two years ago that it would be in place this summer -- and the fact that a lower blood alcohol level is seen as a key to reducing deaths and serious injuries on the roads. Dr Declan Bedford, author of a 2008 study which found that alcohol was responsible for one in three collisions, warned that people would continue dying until our drink driving culture was tackled.So far this year, 163 people have died on the roads. Alcohol could be a factor in as many as 50 of those deaths. He also said that new limits should be lower than currently proposed. "The evidence is very clear. Any amount of alcohol impairs driving," he said. "The longer we wait, the more people will die and the more people will be injured. Alcohol is a factor in one in three collisions. Culturally we couldn't move to a 20mg limit, and it will be hard to move to a 50mg limit. The only reason people stop drink driving is because of a fear of getting caught, it's not because they fear getting killed." International experience shows that lower limits leads to a reduction in road collisions. In Switzerland road deaths fell by 20pc when the limit was lowered from 80mgs to 50mgs in 2005, and when Sweden lowered the limit in 1990, fatal alcohol-related accidents were reduced by 10pc. Similar experiences were found in Austria, Belgium and France. There is intensive lobbying from publicans and senior Government TDs including Education Minister Batt O'Keeffe and Ceann Comhairle John O'Donoghue against a lower limit. PARC Road Safety Group wrote to all members of the Oireachtas including Mr O'Donoghue to find out where they stood on proposals for a lower drink driving limit and compulsory testing at collision scenes. We enclosed the latest research on alcohol related deaths in Ireland. In our letter we stated that "drink driving (legislation) is the most challenged piece of legislation on the statute books in Ireland; therefore, the wording of the bill is of paramount importance. PARC Road Safety Group would welcome an indication from you that you agree in principle with the proposed changes in legislation in the forthcoming Road Traffic Bill". Mr O'Donoghue's secretary sent a letter back on his behalf, saying he could not become involved. "In view of the Ceann Comhairle's constitutional position and as the final arbiter on matters which may arise in the House during debate on legislation, the Ceann Comhairle cannot become involved in matters which are political in nature," he wrote. However, Mr O'Donoghue did forward the letter from PARC to Justice Minister Dermot Ahern. Between July 1 and December 1 last year 2,716 learner drivers have been issued with summonses for driving unaccompanied by a qualified driver and 2,966 drivers have been issued with summonses for failing to display 'L' Plates.Conviction for a first offence is a fine of up to €1,000. A second offence is a fine not exceeding €2,000, and a third or subsequent offence is a fine not exceeding €2,000 and / or three months imprisonment. As of April 30 2009 there are 247,747 learner permit holders. Garda PULSE computer system programmed to record breaches of the Road Traffic (Licensing of Drivers) Regulations 2006. Garda spend up to €15 million annually on consultants to run the Pulse system which was introduced 15 years ago but this system is still not available in over half of the Garda stations in Ireland. A big thank you to all of the ladies who took to the streets of Dublin in their PARC high-vis vests to promote road safety issues. Also a sincere thank you to all those who sponsored us. PARC letter to Brian Cowan. I am writing to you to remind you once again that the long promised new Road Traffic Bill has not yet been brought before the houses of the Oireachtas despite promises time and time again since April 2006 that we would have this legislation without delay if Fianna Fail were returned to power. Our hope is that The new Road Traffic Bill - which will include measures to reduce the drink driving limit and introduce compulsory testing at all collisions attended by the gardai - will be a major step towards saving lives on Irish roads. It will bring Ireland further in line towards best international practice in road safety. No family in Ireland will thank you if they lose a loved one as a result of procrastination on life saving legislation. · What is the position of this legislation at present? · What is holding up the legislation at present if it is not political posturing? · When will it be debated by the houses of the Oireachtas? · When do you expect it will it be signed into law? We earnestly ask you not to lose sight of this very important matter despite the economic difficulties of the country. Lives, human misery and suffering are all at stake here and this is just too high a price for Irish people to keep on paying. Reply from Mr. Dempsey on 29th May 2009 regarding lower drink driving limits. I wish to acknowledge receipt of your email dated 26 May 2009 to An Taoiseach, Brian Cowen TD, regarding the new Road Traffic Bill. Work is progressing on the legislation. It is expected that it should be published during this session of the Dáil. The passage of the legislation through the Dáil is then a matter for the Houses of the Oireachtas so I cannot make any predictions on that timescale. 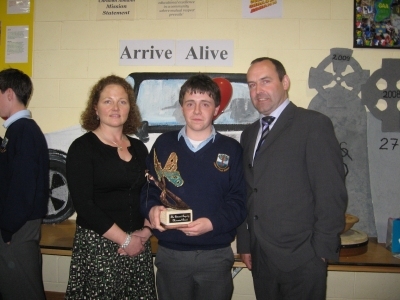 Mr Noel Brett pictured with Ms Sharon Smith teacher Colaiste Craobh Abhann Kilcoole, Co. Wicklow and a student representing the Transition year group from the school who won the Edmond Fogarty Memorial Award for Road Safety presented by Co. Wicklow VEC in memory of their friend and colleague who was killed in a road traffic collision in 2001. The Award was designed and made by Mr Padraig O Murchu of Greystones, Co Wicklow. The Co Wicklow VEC Environmental Awareness Awards took place on Wednesday 13 May in the Brocagh Resource Centre in Laragh, Co Wicklow. The keynote speaker was Mr Noel Brett CEO of the Road Safety Authority who travelled from Ballina for this event. For the local VEC it was a very special night when they were launching the Edmond Fogarty Memorial Award. This Award is for a project in the new Road Safety Category in the Environmental Awareness competition which is now running for 11 years in the VEC. Edmond started his teaching career in St. Kevin's Community College Dunlavin. For a time he was a research officer in the Curriculum Development Centre in Shannon Co Clare and thereafter served as both Vice - Principal and Principal of Abbey Community College Wicklow Town. For a short period before his untimely death he was the Education Officer of Co Wicklow VEC. The beautiful award presented by Mr Brett to the winning school Collaiste Craobh Abhann was designed and created by the well known craftsman Mr Padraigh O Murchu form Greystones Co Wicklow. The award itself is of a bronze butterfly depicting the beauty and fragility of human life. Mr Brett began his talk by making the students aware that there are very few accidents on the road instead there are a great number of collisions and that these were caused mainly by alcohol, drugs, speed, recklessness, tiredness and the use of mobile phones. He asked the first nine rows of the audience to stand up to show how many funerals had taken place in Ireland this year to date, due to preventable road collisions. He reminded the audience that it was easy to count the dead but that the injured are often forgotten and he went on to explain how horrendous these injuries can be. Noel in his very thought-provoking speech told the students how small changes could make a huge difference to the mortality and injury rate on Irish roads. He asked them to look at their attitudes to wearing seat belts especially on the school bus or to those cyclists who are responsible enough to wear helmets and reflective clothing. He addressed the young men of the group in particular and got them to think about the huge responsibility they carry when taking the wheel. He got them to think about what it might be like to have someone's death on your hands or to be the cause of injuries that leave someone, maybe even a loved one, incapacitated for life. He reminded the girls that it is often the lad who tells you he loves you that puts you at greatest risk of being killed through excessive or inappropriate speed. He asked each student to take initiative and give appropriate advice to the young parent they see not restraining their child appropriately, to wear their own seat belt in the school bus and ensure that younger children do likewise. He ended his speech by telling us that, on his way back home, he would be trusting that every driver sharing the road with him is doing so responsibly. Reply from Minister for Justice Dermot Ahern stating that he has now requested a report on our issue of enforcement levels for learner driver laws. Also reply from Donegal Gardai stating that there are a number of ways that a breach of the offence can be dealt with i.e. adult caution, JLO caution, Fixed Charge Notice or summons. Gardai told PARC that they could not provide us with accurate statistics for specific offences as it is not sufficiently defined on the Garda PULSE system. Labour Transport Spokesperson Tommy Broughan has strongly criticised the Government's continual broken promises to road safety campaigners. Deputy Broughan said, "Road safety organisations such as the outstanding Donegal-based Public Against Road Carnage (PARC) led by Ms. Susan Gray has long been campaigning for the introduction of new road safety measures including the mandatory testing for alcohol and drugs of all drivers involved in a serious road collision. At present, alcohol and drug testing at the scene of a serious road collision is carried out at the discretion of the attending Gardai. "PARC has strongly argued for the need to introduce the mandatory testing measure given the ongoing high levels of road collisions on Irish roads and the significant contribution of drink and drug driving to these collisions. PARC has also highlighted the existence of mandatory testing at serious collision sites across the border in Northern Ireland. Tragically 38 people have already lost their lives on our roads in 2009. In April 2007 former Taoiseach Bertie Ahern said that if Fianna Fail is re-elected compulsory testing will be introduced without delay. On the 16th October 2007 Minister Noel Dempsey said that a new bill to facilitate compulsory testing will be introduced within six months. On the 27th February 2008 Minister Dempsey told a delegation of PARC members that the new bill would be published before the Dáil goes into recess on July 10th 2008. In September 2008 PARC was told the new bill would be published before Christmas 2008. In January 2009 the Department of Transport stated that the bill would be published in early 2009. In February 2009 Road Safety Minister Noel Ahern said in a letter to PARC that the bill would be published in Spring 2009. On February 24th last the Department of Transport stated that the bill will not be published until mid-2009 at the earliest. "PARC and similar organisations carry out tremendous work highlighting the enormous devastation caused to families throughout Ireland because of road deaths and serious injuries. Minister Dempsey must now publish this legislation as a matter of urgency and end this appalling track record of broken promises on such important legislation." PARC request latest figures on enforcement levels with regard to learner drivers. On July 1st 2008 Mr. Noel Dempsey, Minister for Transport introduced a law which compels all learner drivers to be accompanied by a driver who has held a full licence for a minimum of two years. It is an offence for any driver holding a learner permit to drive unaccompanied or failing to display 'L' plates. We in PARC are very concerned at the high level of inexperienced drivers who continue to ignore this law.We have had many reports where only a caution is given to drivers when caught by Gardai. This is not acting as a deterrent to drivers. In our letter to Gardai we have asked for the latest figures on the enforcement levels within their division for our research. There should be mandatory blood testing of everyone who is involved in a road accident, according to Dr Declan Bedford, Assistant Director of Public Health, HSE South, who spoke at the 2008 winter scientific Meeting at the Faculty of Public Health Medicine at the RCPI recently. Dr Bedford also called for the legal limit to be reduced from its current level of 80mgs of alcohol per 100ml of blood. Data obtained from the National Traffic Bureau of An Garda Siochána revealed that between 2003 to 2005, alcohol was a factor in 309 out of 995 fatal crashes which resulted in 1,105 deaths. Of the 661 drivers, 30 per cent were over the legal alcohol limit, and of these 89.5 per cent were male. Dr Bedford added it is estimated that 18 per cent of 18-to 29-year-olds drink and drive and the vast majority of these are men.He also revealed that alcohol contributed to the deaths of more than a quarter of pedestrians aged 15 and over. To combat the problem, Dr Bedford said we need to reduce overall alcohol consumption in Ireland and the price of alcohol and alcohol-related taxes need to increase. He also called for highly visible enforcement and for the legal limit to be reduced. Statistics gathered by Dr Bedford and his research team showed that alcohol-related accidents were most likely to occur between 10pm and 8am on a Saturday or Sunday and he called for gardaí to be more visible at these times. He said that An Garda Siochána had been very keen and receptive to the data however, it came down to a resource issue. Meanwhile, the Medical Bureau of Road Safety officially opened its new premises in the Health Sciences Centre, UCD, Dublin recently. Dr Declan Bedford's recent statements on mandatory testing and lowering of the drink driving limit to the 2008 winter scientific Meeting at the Faculty of Public Medicine at the Royal College of Practitioners of Ireland is a huge endorsement of the work of PARC Road Safety Group. Dr Bedford has been involved over a number of years with the production of Statistics for the Road Safety Authority and there are few people more knowledgeable about what is happening at fatal and serious injury collisions than Dr Bedford. Through his research he would know definitively that many drivers responsible for fatalities and or very serious injuries are not being tested. He speaks with authority when he states that we should have mandatory testing of everyone who is involved in a road traffic collision and that the drink driving limit must be reduced. We in PARC Road Safety Group welcome this backing of our work. It is a huge endorsement for us. We are very pleased that Dr Bedford is also calling for a reduction in the overall consumption of alcohol in Ireland in order to combat the problem of drink driving. He also highlighted the need for highly visible enforcement at the times when collisions are more likely to occur. This is very welcome as now it is not just relatives of the deceased that are calling for change but experts who have scientific evidence of the need for change. By speaking to the medical profession he is preparing the way to ensure that the necessary changes to our laws are facilitated at the Emergency Units of our hospitals. This is great news for PARC Road Safety Group. Though it will mean some extra work for doctors and nurses in these units to take samples of blood or urine from road traffic collision patients for forensic testing, in the long run it should greatly diminish the work in Emergency Units due to the deterrent factor. Mr. Tommy Broughan T.D.recently submitted a Dail Question to the Minister for Justice Mr.Dermot Ahern on behalf of PARC in relation to crash form fees. We thank him most sincerely for his support of our Road Safety Group. QUESTION NO: 200 DÁIL QUESTION addressed to the Minister for Justice, Equality and Law Reform (Mr. Ahern) by Deputy Thomas P. Broughan for WRITTEN on Wednesday, 4th February, 2009. REPLY. I am advised by the Garda authorities that it is the policy of An Garda Síochána to appoint a Family Liaison Officer to liaise with the family of victims of fatal road traffic accidents and provide timely and accurate information relating to the progress of the Garda investigation of the accident and any prosecutions arising therefrom. I am also advised by the Garda authorities that persons involved in road collisions, their legal advisors or insurers, or other interested parties may, on written request, be supplied with an abstract of the police report, copies of witness statements and sketches or maps of the scene. This information is not supplied in cases where criminal proceedings are contemplated or have been initiated. Fees for abstract reports and copies of witness statements and photographs are charged in order to recoup costs incurred in the preparation of same. There are no plans to provide an exemption for such fees at this time. The Deputy may also be aware that there is a statutory requirement for an inquest to be carried out in respect of all road traffic fatalities. PARC members consider it very unjust that those who have been injured on our roads or whose relatives have been killed have to pay for copies of Garda descriptions of the collision scenes.They must pay €41 for a Garda "Traffic Accident Abstract Report" which consists of a Garda summary of the collision, the different vehicles involved and basic details like the date and place. Families must also pay €21 for each copy of a witness statement. Many of these people were blameless in the collisions yet they have to fork out to know how they were so badly injured or how their loved one died. We are urging the government to abolish this charge which can be very substantial. The Department of Transport has confirmed that the Road Traffic Bill, due to be published this spring, will provide for the compulsory testing of all drivers involved in a collision.The rules will apply even if the driver is not suspected of being at fault. This will be a major deterrent to drink driving and we now wait for this Bill to be brought before the Oireachtas to be voted in. The Road Safety Authority supports the introduction of mandatory testing of all drivers involved in collisions. It would be a major deterrent in the context of preventing people from driving after imbibing alcohol or taking drugs. This would mean the people who drink and drive and who are involved in collisions would no longer get away with it. Up to now many of those involved in collisions have managed to avoid being breathalysed due to the fact that they were injured, that there was not a breathalyser available or whatever. Families would also achieve closure. If a person were innocent and had not been driving under the influence when a collision occured, people could not state that he or she was drunk. If a mandatory regime were introduced, not only would a person who drinks and drives be breathalysed if a garda suspected him or her of being under the influence, he or she would also be tested if he or she were involved in a collision, regardless of whether he or she caused it. This would act as a major deterrent and would impact significantly on drivers' behaviour and their willingness to risk driving when they have consumed alcohol. Research indicates that most people weigh up the risks of being caught before they drink and drive and act accordingly. The more mechanisms we can put in place to increase the risk of people being detected and prosecuted, the more we will reduce the number of individuals who engage in that type of behaviour. The Road Safety Authority (RSA) has launched a consultation process to seek the views of the public on the introduction of a Graduated Driving Licensing (GDL) system for learner drivers in Ireland. The aim of a GDL system is to reduce the number of collisions, deaths and injuries among learner drivers, particularly the high risk 17 to 24 year olds, during the learner period. GDL systems generally place a range of restrictions on learner drivers which also apply for a period, usually two years after passing a driving test. "The introduction of a Graduated Licensing system and reforming the way people learn to drive in Ireland is an important part of the Government's Road Safety Strategy 2007 to 2012." said Noel Brett, Chief Executive, Road Safety Authority. "The objective of the consultation process is to seek the views of interested parties and open up a discussion on the introduction of a Graduated Licensing system that's appropriate for Ireland." "Learner drivers are vulnerable road users and face greater risks and challenges due to their inexperience. Evidence suggests that the best way to reduce risk is to introduce measures that are designed to protect them until they have built up enough experience behind the wheel." Added Mr. Brett. The RSA has produced a consultation paper entitled 'Graduated Driving Licensing System - Consultation Paper 2008'. This document gives a background to the way learner drivers are taught to drive in Ireland, highlights Ireland's road safety track record and gives examples of GDL systems in other countries and how successful measures have been in reducing risk among learner drivers. Finally it introduces specific measures that could be considered for this country and seeks feedback from the public. "The purpose of this consultation paper is to look at the likely practical implications of introducing changes to the way people learn to drive and to look for the views of the public on the likely impact of these changes." commented Mr. Brett. "Some changes have already taken place. For example the old provisional licence has been replaced by a learner permit. All drivers holding a learner permit must now be accompanied by a driver who has held a full licence for a minimum of two years. A person may not take a driving test for six months after gaining a Learner Permit." He said. In tandem with this consultation process the RSA is carrying out a study of the way people learn to drive in Ireland and this will involve further research and discussions with many organisations involved in driver education, licensing, instruction and testing. Graduated Licensing systems are in place in a number of countries, most notably Australia, New Zealand, the US and Canada. A number of EU countries have partial GDL in place. The consultative process will last for eight weeks. The closing date for receipt of submissions is Friday 13 March 2009. Comments can be emailed to gdlconsultation@rsa.ie or they can be posted to GDL Consultation, Road Safety Authority, Moy Valley Business Park, Primrose Hill, Ballina, Co. Mayo. Copies of the consultation paper can be found on the RSA's website www.rsa.ie by requesting it from gdlconsultation@rsa.ie or by contacting the RSA on locall 1890 50 60 80.